“How to Make an Attractive City”, a video by The School of Life, recently gained attention in social media. Well presented and pretty much aligned with today’s mainstream urbanism, the video earned plenty of shares and few critiques. This is probably the first critique you may read. 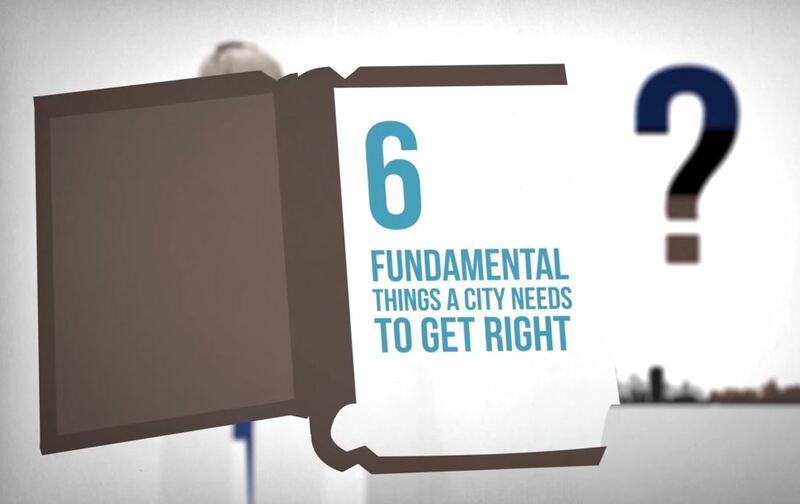 The video is divided into six parts, each with ideas the author suggests are important to make an attractive city. I will cover each one of them separately and analyze the author’s conclusion in a final section. The author argues that a city must establish simple rules to to give aesthetic order to a city without producing excessive uniformity. From Alain Bertaud’s and Paul Romer’s ideas, it can make sense to maintain a certain order of basic infrastructure planning in to enable more freedom to build in private lots. However, this is not the order to which the video refers, suggesting rules on the architectural form of buildings. The main premise behind this is that it “is what humans love”. But though the producers of the video certainly do love this kind of result, it is impossible to affirm that all humans love a certain type of urban aesthetics generated by an urbanist. It is even less convincing when this rule will impact density by restricting built area of a certain lot of land or even raising building costs, two probable consequences of this kind of policy: a specific kind of beauty does not come for free. The video also makes a factual mistake when it states that London skyscrapers are carefully planned. Their location, in fact, is based on preserving specific viewing corridors established almost 200 years ago. As The Economist reported last year, views of these landmarks have completely lost its relevance in contemporary London. The video argues that cities full of street life are more desirable. That is observably apparent, as people’s preference is observable in their chose to be drawn to these spaces. Nevertheless, the video makes a contradiction: first saying that Hong Kong is an example of a city with street life, then claiming cities full of skyscrapers aren’t conducive to street life. Cities with “anonymous commercial towers” do not necessarily lacks street life: New York, Hong Kong, Tokyo and City of London are examples of cities full of skyscrapers that have active street life. Suburbanization and sprawl has been vigorously incentivized by public policy, most massively in the United States. United States policy featured an Interstate Highway System with massive investment in large road projects; education funding that favored good public schools in the suburbs; subsidies that favored owning larger-and-larger homes such as Mortgage Interest Deduction; zoning restrictions such as minimum lot areas and setbacks, as well as state support for the auto and oil industry. These programs fueled a form of urbanization we’ve come to know as suburban sprawl. Compact cities, which the videos celebrate have typically grown spontaneously without significant interventions. The historic European and Brazilian downtowns typically have shorter commute distances, an intensive street life and a smaller dependency on the automobile. It is true that people have diverse preferences for urban form, and that an attractive city can supply a greater variety of forms. However, it is dangerous for a city to dictate a certain kind of urban form for the city as a whole, even if it is a mix between different models. Although we can control form within a neighborhood or a large-scale development, municipal norms with these goals in mind can generate distortions exactly because of the infinitely varying preferences of the citizens. Incapable of catering to all the subjective preferences of everyone that participates in the city environment, planners inherently lack the capability to determine ideal quantities of orientation and mystery the video suggests. In a truly organic and complex city, orientation emerges in a truly spontaneous and decentralized way that brings more “mystery” than any planner can fathom. Here the author quotes Joseph Campbell: “If you want to see what a society really believes in, look at what the biggest buildings on the horizon are dedicated to”, and deduces that we don’t actually collectively value sports shoe corporations, tax specialists, the oil industry and pharmaceuticals, as a few examples. But is that in fact true? A certain citizen may even say that he does not value these corporations and services, but he is a daily consumer of shoes, he pays his taxes, burns fuel and uses plastic products. And when he gets sick, he relies on pharmaceutical drugs. In the behaviors of each person, a preference for these goods and services is in fact revealed. The video misunderstands how the complexity of the economy actually works and how preferences in society are be manifested. What happens within tall commercial buildings is never as simple as their appearance. They often house the companies that produce or support the computers we use, the planes we fly in or the milk we have with our everyday breakfast. Such a city reflects the social valuation of a complex network of voluntary action that generates the products and services that make our lives better. Soon the author argues for preserving views and limiting building heights to five stories. The rule itself is a paradox, as a four story building will have its view blocked by a five story building. Going even further with this reasoning, we can infer that a single-story house can block the view of another single-story house. Arguing for the preservation of views is, in fact, a direct contradiction with what it means to live in a city. In any case, it is not reasonable to limit buildings within a city to five stories. The height of the old cities the video refers to was not defined by planning norms, but by practical necessity of walking up and down stairs in an era before the elevators we now take for granted. In contrast to today, top floors in pre-elevator buildings were always the cheapest as they were the hardest floors to reach. Limiting building heights to five stories suggests an artificial and arbitrary limit to real estate supply, a tangible side effect of the “sense of insignificance” the producers of the video talk about. The video says that buildings must not look alike everywhere in the world, as his trips get boring and because each city has a specific climate, needs and different positive and negative attributes. It argues for a strong local character and for the use of local forms and materials. This is very true with commercial real estate in Latin America, where developers have built several glass towers which are totally inadequate for a tropical climate. These designs are intended to copy temperate climate buildings in developed countries, where the “greenhouse effect” within glass-enclosed buildings is conducive to indoor working environments. Smart builders will certainly learn from these mistakes and develop more adequate local solutions instead of imitating inefficient and inadequate forms. The use of local forms and materials, however, is a major problem. Aesthetic and architectural form – trying to separate it from building technology – were always globalized, being influenced by different cultures and ideas. The same argument goes for materials: locally available materials will hardly be the best for every specific building. This principle can be applied to any object. It is impossible to imagine a pencil, a single and relatively simple object, to be produced only with local materials, much less an entire city. The historical examples given in the video were built that way mainly by lack of options, not by an aesthetic or functional preference. The only contemporary example given, architect Glenn Murcutt, does not use local materials and whether he designs are distinctly “Australian architecture” is a very subjective interpretation. In the last section, the author asserts that the greatest challenges to implementation of these ideas are a lack of political will and intellectual confusion about aesthetics. This was one of the most dangerous ideas the video communicates. In saying that it is possible to affirm what is inherently beautiful or ugly, is realistically impossible as these are not universal truths. I personally know people who find the glass towers the author hates beautiful. Others think the Brazilian favelas or the shantytowns in Bangkok are the most amazing and spontaneous expression of humanity. Some even think Paris is not the romantic city travel guides tell us, but instead a repetitive and boring vision of the past. The stand the video takes is worrying, as it argues for a correct and universal aesthetic enforced by increasing political power. The tourism statistics used in this argument is simply false. Dubai, Singapore, New York and Hong Kong are part of the top ten most visited cities in the world and represent urban aesthetics and form opposite to the one argued in the video. For example, my personal experience of Frankfurt does not align with what the video says: I had the opportunity to spend a few days there on vacation and thought the city was amazing. The final conclusion is an attack on real estate developers, who apparently greedily fight to make the city an ugly unattractive place. Unfortunately not everything is easy in this world. Some developers invest in renowned architects to serve niche clients and citizens that are willing to pay a premium for aesthetic extravagance. However, those who build for the masses cannot budget for extravagance, as real estate is usually the largest expenditure in someone’s life – and the burden of housing costs ever growing in most part because of very regulations the video is promoting. The given example of New Town, Edinburgh is actually perfect, as it is one of the most expensive neighborhoods in town. Ironically it’s probably the neighborhood with the least amount of street life because of it’s strict residential zoning. Another contradiction is when the video argues a city cannot be shaped by a free real estate market. However, most of the cities the video uses as good examples were, in fact, built by within extremely deregulated real estate market compared to today’s standards. This is true for almost all medieval cities, old London neighborhoods, the Marais in Paris (what was untouched by Haussmann’s renovation) with the additional examples of Hong Kong, New York and even the historical centers of Brazilian cities. By understanding the city as a complex, emergent environment, we should let go of the urge to impose our personal interests in urban form. The video’s final conclusions, calling for an increase in government control and a rigid regulation of the urban environment is as dangerous and has the same mindset as the failed plans of Brasilia. And as dangerous as modern urbanism theory in general, which sees the city as built physical space that can be modeled by what planners want to achieve. Cities must be the result of spontaneous and voluntary action by all its citizens, not of a committee that decides what is right, wrong, beautiful or ugly. Restraint from imposition by those who arrogantly proclaim they know what’s best for the extremely complex organisms we call cities will eventually lead to what I like to call planned chaos. If individual purchasing decisions somehow aggregate into “true” societal preferences for built environments, if all decisions are rational, if no externalities exist, and if the debatability of aesthetics means that aestehetics are irrelevant and collective decisions shouldn’t be made, then sure, your critiques are valid. 1. “Not too chaotic, not too ordered” – this is so subjective as to be utterly meaningless. It has zero planning value. 2. Five stories – this, on the other hand, is precise but utterly arbitrary and, frankly, absurd. Where would the people in Hong Kong live if the city was restricted to five stories? 3. Use of tourism as a metric of good urbanism – this is demonstrably absurd. Lots of people go to Paris for tourism, but lots of tourists also go to Orlando, or Las Vegas. What do those cities have in common? Basically nothing. De Botton’s video is the worst sort of shallow TedTalkism, and the fact that it got such wide, uncritical circulation is a sad reflection of contemporary urbanist thought. 2) All decisions aren’t rational, but they *tend* to be rational. And the same goes to planners. 3) Yes, externalities exist, but the solutions given in the video don’t solve them, as while trying to create positive aesthetic externalities they create many other problems I have mentioned above. 4) Aesthetics are not irrelevant, they are just personal and subjective, impossible to be determined as a collective standard. 5) Infinite collective decisions are made in a free market city, see Emily’s and Hayek’s article again to understand that concept. 1. Yes, I understand the idea that purchases represent preferences and market feedback, but the problem with your vision is extreme over-simplification, the elision of the role of wealth, the assumption that an unregulated market creates desirable and equitable outcomes, and the assumption that real estate is a simple AS-AD market. The problem with mapping extremely specific (and generally derided) economic theories onto unrelated domains is that you leave behind facts and the comfortable confines of theory, and are left with qualitative pseudo-philosophy. 2. Richard Thaler, Daniel Kahneman, and most economists working after 1970 would disagree with you. Additionally, rationality is a dependent variable of time frame. 3. I don’t disagree with you in terms of current planning regime results, but the solution isn’t to abdicate responsibility and abandon our ability to create pigovian outcomes, it’s the use of data and research to do better. 4. First, form does not equal aesthetics. Second, if you think collective standards didn’t result in the aesthetic success of our existing cities, than you need to read more history. The idea that aesthetics we’re not strongly argued, dictated, and driven by controlling powers (in most cases authoritarian) is a libertarian myth. Additionally, the idea that aesthetics can’t be valued is absurd. 5. Economic outcomes do not equal collective decisions. 1. Not pseudo-philosphy. Please read articles mentioned and also Ed Glaeser, Alain Bertaud, Sanford Ikeda, David Schleicher and many articles at Market Urbanism for more references. 2. Planners are just as rational (or irrational) as others. Not a strong argument as irrationality is not eliminated from your proposal. 4. Please explain how to objectively value aesthetics, then. Also please read history of medieval cities: aesthetic standards defined as result of local materials and building techniques, not aesthetic regulations. 5. You did not read the articles mentioned as arguments to this point. You criticize the video several times just for proposing regulations at all. But – although the older cities that are so compact, attractive, and popular with tourists may have grown up without explicit regulations like these, certain limitations existed nonetheless. You said as much in another comment here, where you mentioned limitations due to materials and building techniques. One could add more: the necessity to build more densely because one could not commute very far in the past; greater social pressure to conform to existing stylistic norms; that buildings were put up by the occupants themselves (or under their direction) rather than a developer who would mass produce and sell for profit; the mere fact that the people responsible for the design probably lived nearby rather than hundreds or thousands of miles away. (Of course these were not all true, everywhere, at all times – I am generalizing.) Since we have lost so many of these limitations due to technological and societal changes, the creator of the video would like to bring back some limitations in the artificial manner of legislation. But the intended effect is to only regain the same constraints we used to have anyway, which have already produced some of the world’s greatest cities (and villages/towns). You also mention “imposition by those who arrogantly proclaim they know what’s best.” As far as I know the author has not launched a coup on any city government; he is rather advocating that individuals will bring about change in their own cities, through democratic means. If they agree with his ideas and they do so, what’s wrong with that? And if they don’t agree, then then nothing will happen anyway, so what’s the problem? I wonder what you mean when you mention “the burden of housing costs ever growing in most part because of very regulations the video is promoting” and then give the example of New Town in Edinburgh. Unless it was intrinsically so costly to build (due to regulations on the materials, techniques, density and height limitations etc.?) that the costs are still being borne today, I would argue that the current high cost is not due to any regulations, but rather due to there not being enough other areas with similar regulations. It’s supply and demand. There are more people who like neighborhoods like New Town than available homes in neighborhoods like New Town, so the price rises. Look at it this way – if any design principle or regulation is actually good, it will necessarily make an area more desirable, and inevitably more expensive. If you reject a design principle or a rule on the grounds that it makes an area more expensive, you’re precluding ever making improvements. How about instead, if an area is doing well, find what makes it successful and pricey, and try to replicate it? The more desirable areas we have, the more affordable they will be. However, though many people would love to live in a dense urban environment, there is little new construction of this type; most new residential construction that I’m aware of is suburban (even when technically inside a “city”). Some people genuinely want to live that way, but many just can’t afford anything else due to the low supply. 1. Cut him a little slack, he’s making a general point! If it came to it, one could posit something more specific and objective for a certain city or neighborhood. 2. There is some evidence that after the 4th floor or so, the rate of mental disorders increase. One is more detached from life on the street level and connections with neighboring buildings. I lived for a while on the sixth floor of a building, and it would take about five minutes to get from my apartment to the sidewalk, what with waiting for the elevator, riding it in frustration as it stopped on every floor, and walking through the long lobby – and of course this was doubled when I would return. The extra 10 minutes wasted certainly led to me think twice any time I felt the urge to go out for a short trip. No to mention taller buildings require more energy input to build and maintain, and are terrible to be find yourself in if you ever need to evacuate in an emergency. There are more reasons, but I’m trying to keep this short. Where would people live if Hong Kong were restricted to 5 stories? How about in multiple cities on a more human scale, instead of in one big megalopolis? I don’t think it’s a given that a city has to be able to accommodate a limitless number of people. 3. Orlando is popular because of Disney, and Vegas is popular because of the gambling and the spectacle of it. Not because they are great cities. If you add a unique attraction, even the worst city will get visitors. Do you think if you took it away, they would have the same pull? Look at New York – it gets hordes of visitors, yet the most touristed areas are the most uncomfortable for living in, and are shunned by locals. The parts that are on a more human scale as described by the video, such as Greenwich Village, do get tourists but are also more popular with locals. 1. His point is that regulations try to mimic the outcome of previous city building, which were produced by technological limitations, not by choice. Medieval cities did not discover the Ideal Number of Stories In A Building in the same way that the Greeks discovered the golden ratio. Reproducing an outcome that was optimal under a different set of technological and economic conditions will not produce an optimal outcome under modern technological and economic conditions. 2. So your point is that New Edinburgh is only expensive because other places are cheaper, and that if they also had more arbitrary regulations then it would be normal to spend X amount on housing? Like you say, it’s supply and demand. What happens when you artificially limit supply but demand stays the same? 3. There’s a difference between opposing regulations that artificially make things more expensive to enforce a subjective aesthetic and being against things being more expensive in general. He’s not proposing that we outlaw renovating kitchens to add marble countertops. He’s saying that there is a real cost to regulating an artificial aesthetic limit to the heights of buildings. If people really will pay a premium to live in 5 story buildings then developers will quickly learn that it is the ideal height to build. But until we establish that people universally love 5 story buildings and develop vertigo at anything higher, we shouldn’t outlaw anything above 6 stories. It’s ironic that you complain about the lack of dense urban development, given that zoning bylaws meant to freeze cities in time and enforce a vision of an ideal city are what mandate suburban development and make intensification of urban areas difficult and expensive. 1. Yes, the characteristics of older cities were generally not the result of free choice, but various limitations. Why does this matter? The video does not claim one way or the other; it is just saying that older cities are showcases for some very popular characteristics. I would amend your statement at the end to “Reproducing an outcome that was optimal under a different set of technological and economic conditions will not *Necessarily* produce an optimal outcome under modern technological and economic conditions.” But do you really think an older way will never be better? It may or may not, and I think you have to evaluate each outcome for its own worth. However my hunch is that a lot of the outcomes we had under more limited circumstances are actually more likely to be preferable to many people, precisely because they came about in the first place under a more direct, personal, human process. 2. That Newtown is more expensive because other places are cheaper is not my point, it’s just a tautology. I’m saying it’s more expensive because people prefer it over other places. I’m not sure why you’d consider people’s preferences arbitrary, but even if you do, if there were more places like it they would be “arbitrarily” popular too. I’m not talking about limiting the supply, I’m talking about increasing the supply. 3. There is evidence that mental disorders increase after the fourth floor or so. It’s hard to argue that you are not more isolated the further you are from street level. I know when I lived on the sixth floor of an apartment building in Queens NY I thought twice every time I wanted to go out, because each trip had about 10 wasted minutes tacked on to it – between waiting for the elevator, riding the elevator as it stopped at every floor, and walking through the long snaking lobby. I also know that the more people in one building, the less control any of them has on over any aspect of the building or grounds. I could not just add a balcony, repaint the exterior, or even change my windows if I wanted to. I could not have my own entrance with my own planters, or even share one with a couple of families. There was once impersonal entrance for a hundred families, which was everyone’s and no one’s. And it’s impersonal in two respects – for the inhabitants, who cannot express themselves, and for passersby, who walk through street after street and never see anything interesting, exotic, personal, or meaningful. You lost me a bit at the end. I don’t see the irony you’re referring to. Instituting certain maximum heights does not have to freeze cities in time, because changes can still take place; and it does not have to limit density too much since it can be made up for in other ways. For example, you could also have a minimum height of three or four stories, and you could have narrower roads and less parking areas. Yes, it would ultimately limit density once you had every building at maximum height and every bit of ground covered – but so what? I don’t think it’s a given that any city has to accommodate limitless numbers of people. Not everyone has to live in one giant megalopolis, they could actually live in multiple, somewhat smaller and more human-scaled cities. I don’t know if I agree with you about developers quickly learning and building what people want. For one thing, when it comes to certain matters, people are not always even aware of what they want. Many people would have trouble designing their own home. People may look at the luxury aspect of a fancy apartment on the 50th floor but not think about any adverse affects to living so high up, because they can be subtle – even if/when it does effect them, they may still not realize what’s going on. And on the horizontal axis – my mother moved from the city to the burbs because she sincerely thought the city wasn’t a good place to raise children. However she didn’t realize how negatively we would affected by not having friends/stores/interesting places within walking distance. Secondly, most individuals are pretty limited (by budget, availability in their desired location, and time) when it comes to choosing a home and expect to have to make compromises. They routinely settle for less. So in order to turn a profit developers do not usually have to perfect a house or apartment the way creators of some other products might.